Last weekend I spent roughly an hour rummaging around looking for one of my old mainstay recipes. I couldn’t find it because it was written either on a scrap of paper or on the inside cover of a lyric book I used for my band that sadly hasn’t been touched in close to 2 years. This recipe originally appeared in the Bark & Grass Vegan Cookbook (cook zine really…) by Kim Nolan, that was printed in the early 90’s. For some reason, I think I bought it at the 1992 More Than Music Festival in Dayton, OH. I carried this zine with me from Buffalo to Baltimore to D.C., back to Buffalo and finally to Chicago. Over time it became increasingly tattered and it finally met the trash can when a very young, Ian Mackaynine, ravaged all of the books on the lower shelves of my bookshelf the first time he was ever left alone overnight…needless to say, Bark and Grass was among them. The zine was reprinted here and there, but hasn’t been in print for years, so I only have 2 of the recipes still within my possession: French Toast and Pancakes. Okay, story time is over so let’s make some French Toast! Grab a shallow bowl wide enough to accept a piece of bread horizontally. Mix up the dry ingredients. I’ve used a variety of dry sweeteners over the years – cheapo sugar, sucanat, and Vegan Cane Sugar from Whole Foods. It all works the same but we prefer the Vegan Cane Sugar from Whole Foods because its clearly marked. Then add your wet ingredients. I can’t remember if the original recipe from Bark and Grass used the mix of water and soy milk that I listed, as my only existing version of the recipe is hand written and I know that using all “milk” makes the batter a bit thicker and thus, doesn’t cover as many pieces of bread. The days of clinging to soy milk for every recipe have also passed (which is what the original recipe used), so the French Toast pictured used plain almond milk because that’s what we prefer. Mix up the batter and heat up the pan on low-medium heat and melt some margarine on the pan. Let’s take a moment to talk about vegan bread. Most cities have some local bakery that provides fresh Italian and/or sour dough bread to local businesses. This isn’t usually “top of the line” bakery bread, but its fresh and not full of all sorts of crappy processed food ingredients. Instead its your typical: flour, water, salt, yeast sort of bread. This stuff is ideal for French Toast. Since you’re essentially burying most of the original bread’s flavor in sugar and cinnamon, there is no reason to use the best vegan organic bread that money can buy. So feel free to use the slightly cheaper vegan bread or even stale bread for this dish. Bread tirades aside, dip your bread in the batter coating both sides. Don’t soak it all the way through or you’ll end up with soggy French Toast. Just make sure the entire surface of both sides is coated. Toss each piece in the pan and cook until browned and dry on each side. Finally, when you get down to the bottom of the batter, you’ll find that all of the liquid is gone, but there is still a bunch of the flour/sugar/cinnamon. Don’t let that go to waste. Pour another tablespoon or two of almond milk into it and you can squeeze out another 1 or 2 pieces from it. All told, you should expect to make 6-10 pieces of French Toast with this recipe depending on the size of the bread. I use hashbrowns as a base for a meal on a regular basis. It’s something I learned from Nick. The neutrality of the potato allows for a wide variety of flavors to be added, as well as various vegetables, vegan meats, vegan cheeses, nuts, etc. This simple meal has taught me how to be a better cook by allowing me to experiment with a wide variety of spices, like cumin, chili powder, curry powder, paprika, etc. as well as whatever I happen to have in my fridge. I always make sure I have a bag or two of frozen hashbrowns in my freezer. 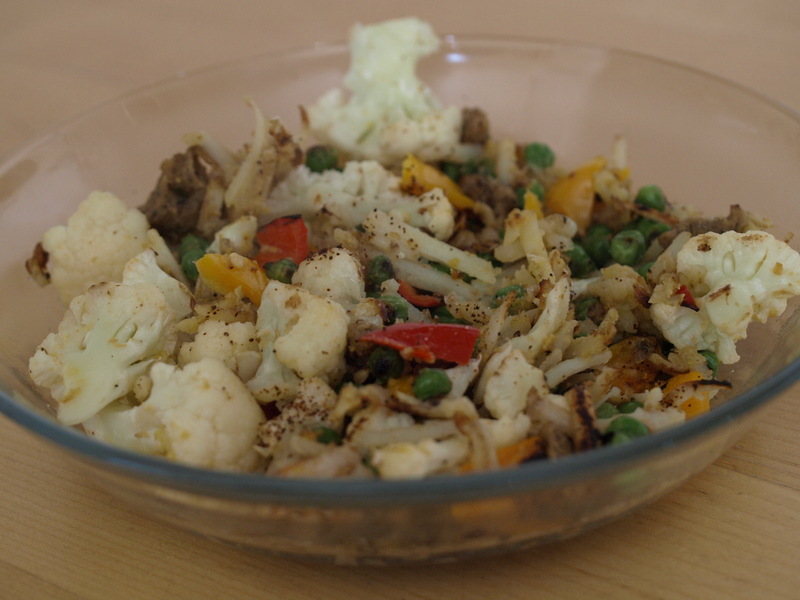 Today’s meal was made up of cauliflower, red and orange bell peppers, peas (frozen), nutritional yeast, Upton’s ground beef seitan, chili powder, flax powder (have to get those Omega 3s in there) and a little bit of olive oil and salt. What I typically do is pour half a bag of hashbrowns into a pan coated in oil and place the heat on medium. Then I chop the veggies before adding them and stirring everything around to make sure everything has some oil on it, so nothing sticks to the pan. I don’t add spices until the end when most of the hashbrowns have browned because they absorb a lot of the oil. If you add them beforehand it’s not the end of the world though, just add a little more oil to keep things from sticking to the pan, don’t add water cause your potatoes will turn to mush. I typically also add nuts, daiya and hot peppers towards the end if I’m going to add them because burnt nuts can ruin a meal, spicy peppers heated for too long can become unbearably hot and Daiya can melt and stick to the pan instead of your food, which is a waste. Do some experimenting of your own. It’s an easy meal, you can throw in pretty much anything you have in your fridge and more often than not you’ll be pleased by your results. Southwestern Style: Hb’s, jalapenos, corn, peas, green onions, chorizo, flax powder, vegan cheese (the cheese can help cut the heat of peppers sometimes), and chili powder. Indian Style: Hb’s, peas, cashews, garlic powder, cumin, curry powder and coriander powder. Midwestern Style: Hb’s, broccoli, Daiya cheddar cheese, onion powder. I eat hash browns as a meal on a regular basis. I recently made these for a pancake brunch. Pour the olive oil into a medium sized non-stick pan. Sautee scallion over medium heat, add green pepper and hash browns. Mix everything together, lower heat a little and let potatoes fry (the key to good hash browns is patience). Pour nutritional yeast and cheddar evenly over potatoes. Flip potatoes when they begin to brown on the bottom. Mix in cheese and nutritional yeast as you flip the potatoes. Wait until other side has browned. Add salt to taste. Serves 4-6 people as a side dish or 2-3 people as a meal.